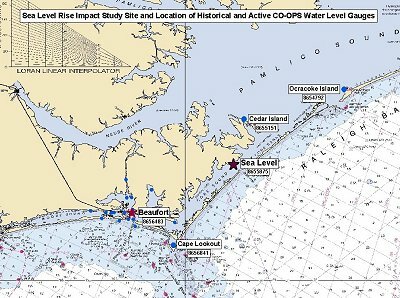 NOAA's Center for Sponsored Coastal Ocean Research/Coastal Ocean Program (CSCOR/COP) is leading a partnership project to investigate the local ecological and human impacts of long-term sea-level rise and sea-level variations for a specific coastal region. The National Ocean Service's (NOS) Office of Coast Survey (OCS), Center for Operational Oceanographic Products and Services (CO-OPS) and National Geodetic Survey (NGS) are providing support for the project. The rise of sea levels has been assessed as a primary coastal and marine stress (The Potential Consequences of Climate Variability and Change, NOAA Coastal Ocean Program Decision Analysis Series No. 21, October 2000). Few studies have focused on analyzing the potential impacts of long-term sea-level rise for a specific coastal region. This project was developed to initiate case-study analyses of regional impacts of rising sea levels, beginning with coastal ecosystems in the sounds and estuaries of North Carolina (specifically, southern Pamlico Sound and the Beaufort region). Projected sea-level variations will be simulated with the creation of a bathymetric-topographic digital elevation model (DEM) in which water-level heights are elevated to correlate with future sea-level rise and inundation scenarios. This model will enable the assessment of local ecological and human impacts based on changing shorelines and near-shore bathymetry. 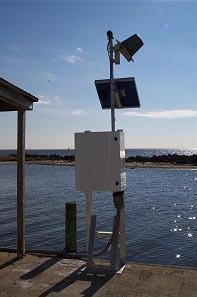 In support of this case study, a short-term tide station was installed for approximately five months in Sea Level, NC (located within Core Sound). Tidal datum elevations were computed from the observed water-level data at this station, referenced to local benchmarks, and connected to a geodetic datum. This data filled a gap in datum information for the project. Comparison of these datums with tidal datums and mean sea-level trends from several long-term stations in the study area will be applied to the coastal DEM to predict shoreline movement and to map potential submerged zones in 25 to 50 years. A special analysis of relative sea-level trends in the pilot region has been completed (North Carolina Bathymetry/Topography Sea Level Rise Project: Determination of Sea Level Trends, May 2004). Long-term frequency analysis of high waters in this region will assist in forecasting inundation impacts during severe weather events. Historical and recent tidal datums provide information about mean high water datum rise and long-term tidal range fluctuations in the study area. The success of this partnership project will promote the importance of sea-level rise studies in other coastal regions, thus preparing coastal managers for the detrimental ecological and human impacts associated with shoreline erosion, newly submerged lands, and storm surge. NOS is also using this study as the template for national assessments being developed with the U.S. EPA for a "Sea Level Rise Deliverable" required by the Climate Change Science Program.